These Terms of Service ("Terms") govern your access to and use of the services, websites, and applications offered by Answercart (the "Service"). Your access to and use of the Service is conditioned on your acceptance of and compliance with these Terms. By accessing or using the Service you agree to be bound by these Terms. You may use the Service only if you can form a binding contract with Answercart, and only in compliance with these Terms and all applicable local, state, national and international laws, rules and regulations. You must provide us accurate information, including your real name, when you create your account on Answercart. You are responsible for safeguarding the password that you use to access the Service and for any activities or actions under your password. We encourage you to use "strong" passwords (that use a combination of upper and lower case letters, numbers and symbols) with your account. Answercart will not be liable for any loss or damage arising from your failure to comply with this instruction. "Content" means any information, text, graphics, or other materials (your CV) uploaded, downloaded or appearing on the Service. You retain ownership of all Content you submit, post, display, or otherwise make available on the Service. By submitting, posting or displaying Content on or through the Service, you grant us a worldwide, non-exclusive, royalty-free license (with the right to sublicense) to use, copy, reproduce, process, adapt, modify, publish, transmit, display and distribute such Content in any and all media or distribution methods (now known or later developed). You agree that this license includes the right for other users of the Service to modify your Content, and for Answercart to make your Content available to others for the publication, distribution, syndication, or broadcast of such Content on other media and services, subject to our terms and conditions for such Content use. Such additional uses by Answercart or others may be made with no compensation paid to you with respect to the Content that you submit, post, transmit or otherwise make available through the Service. (g) contains or links to a virus, trojan horse, worm, time bomb or other computer programming routine or engine that is intended to damage, detrimentally interfere with, surreptitiously intercept or expropriate any system, data or information. Answercart reserves the right in its discretion to remove any Content from the Site, suspend or terminate your account at any time, or pursue any other remedy or relief available under equity or law. (c) upon request, either by Answercart or by a user who contributed to the Content, make a reasonable attempt to delete Content that has been deleted or marked as not for reproduction on Answercart. Your Content will be viewable by other users of the Service and through third party services and websites. You should only provide Content that you are comfortable sharing with others under these Terms. All Content, whether publicly posted or privately transmitted, is the sole responsibility of the person who originated such Content. We may not monitor or control the Content posted via the Service. Any use of or reliance on any Content or materials posted via the Service or obtained by you through the Service is at your own risk. We do not endorse, support, represent or guarantee the completeness, truthfulness, accuracy, or reliability of any Content or communications posted via the Service or endorse any opinions expressed via the Service. You understand that by using the Service, you may be exposed to Content that might be offensive, harmful, inaccurate or otherwise inappropriate. Under no circumstances will Answercart be liable in any way for any Content, including, but not limited to, any errors or omissions in any Content, or any loss or damage of any kind incurred as a result of the use of any Content made available via the Service or broadcast elsewhere. You are responsible for your use of the Service, for any Content you provide, and for any consequences thereof, including the use of your Content by other users and third party partners. You understand that your Content may be republished and if you do not have the right to submit Content for such use, it may subject you to liability. Answercart will not be responsible or liable for any use of your Content by Answercart in accordance with these Terms. (v) protect the rights, property or safety of Answercart, its users and the public. You agree that you have no right or title in or to any Answercart points you may receive or use in connection with the Service or any other attributes associated with your Account, regardless of how they were obtained. Answercart prohibits and does not recognize any purported transfers of Answercart points outside of the Service, or the purported sale, gift or trade of Answercart points in the "real world," unless Answercart expressly authorizes such transfers in writing. Any such transfer or attempted transfer is prohibited and void, and Answercart may cancel any points transferred, assigned, or sold in violation of these terms or points policies and rules. Answercart may change the rules for transferring, receiving, or redeeming credits at any time for any reason. Answercart also reserves the right to stop offering and/or supporting Answercart credits at any time. Answercart may expire, cancel, modify, or delete your Answercart credits at any time for any reason, including for violations of these terms and conditions, or for no reason without notice to you. Answercart may cancel any transaction if we believe that the transaction violates any of Answercart's terms or policies, or for no reason at all. (viii) interfere with or disrupt (or attempt to do so) the access of any user, host or network, including, without limitation, sending a virus, overloading, flooding, spamming, mail-bombing the Service, or by scripting the creation of Content in such a manner as to interfere with or create an undue burden on the Service. 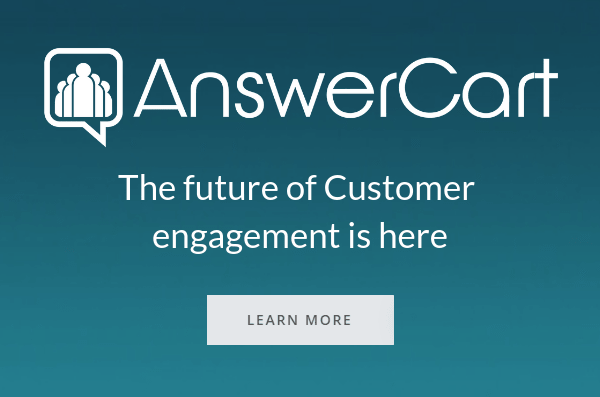 All right, title, and interest in and to the Service (excluding Content provided by users) are and will remain the exclusive property of Answercart and its licensors. The Service is protected by copyright. The Service may include advertisements, which may be targeted to the Content or information on the Service, queries made through the Service, or other information. The types and extent of advertising by Answercart on the Service are subject to change. In consideration for Answercart granting you access to and use of the Service, you agree that Answercart and its third party providers and partners may place such advertising on the Service or in connection with the display of Content or information from the Service whether submitted by you or others. Answercart respects the intellectual property rights of others and expects users of the Service to do the same. We will respond to notices of alleged copyright infringement that comply with applicable law and are properly provided to us. If you believe that your Content has been copied in a way that constitutes copyright infringement, please contact us with necessary details and we will take action accordingly. (ii) the content, products, or services on or available from such websites or resources. Links to such websites or resources do not imply any endorsement by Answercart of such websites or resources or the content, products, or services available from such websites or resources. You acknowledge sole responsibility for and assume all risk arising from your use of any such websites or resources. Your access to and use of the Service or any Content is at your own risk. You understand and agree that the Service is provided to you on an "AS IS" and "AS AVAILABLE" basis. Without limiting the foregoing, ANSWERCART AND ITS PARTNERS DISCLAIM ANY WARRANTIES, EXPRESS OR IMPLIED, OF MERCHANTABILITY, FITNESS FOR A PARTICULAR PURPOSE, OR NON-INFRINGEMENT. We make no warranty and disclaim all responsibility and liability for the completeness, accuracy, availability, timeliness, security or reliability of the Service or any content thereon. Answercart will not be responsible or liable for any harm to your computer system, loss of data, or other harm that results from your access to or use of the Service, or any Content. You also agree that Answercart has no responsibility or liability for the deletion of, or the failure to store or to transmit, any Content and other communications maintained by the Service. We make no warranty that the Service will meet your requirements or be available on an uninterrupted, secure, or error-free basis. These Terms and any action related thereto will be governed by the laws of India without regard to or application of its conflict of law provisions or your state or country of residence. We may revise these Terms from time to time. The most current version will always be on this page (or such other page as the Service may indicate).